Have you ever looked through a kaleidoscope? That’s one of those viewing instruments that are made up of a series of mirrors all leaning into each other at different angles, and when you look through the kaleidoscope, the item you’re looking at is distorted and shows up in different types of patterns. Those patterns are created by reflections repeated in adjacent mirrors. For our purposes today, I want you to think about those kaleidoscope mirrors as the lenses we bring to our view of the world. The moments, the values, the strengths, the cultures, and the environments we experience as we grow and develop show up just like the mirrored surfaces of a kaleidoscope. Some of us might have only a few mirrors while others of us have many. When we view the world through our kaleidoscope, what we see is unique to us. As humans, we often believe that the view through our kaleidoscope is the correct view, although the mirrors we put into our kaleidoscope are merely assumptions or stories we made up, things we invented based on our prior experiences. This very real human tendency trips us up in so many ways. You see, the risk (and the challenge) is when we look at a situation through our unique kaleidoscopic view and then make decisions, try to give advice, or try to convince others that our personal view is the correct one. When we understand and accept that the only view of the world that we have is through our own experiences, culture, history, and values, then we can consciously and intentionally shift into a place where we are considering the facts versus our assumptions. We can rest in a place of being curious versus having to be the expert. When we engage with others by reacting to them based on assumptions or in the expert role – trying to convince them our view is the right view – we run the risk of creating drama, creating unhealthy conflict, and even destroying connections and increasing our isolation. Imagine that a teenager or young adult you care for very deeply comes to you saying they would love to take a year of their life to travel Europe. If you happen to be someone who has never explored Europe on your own or maybe never been there or has been listening to a lot of news reports about kidnappings or bombings or other negative incidents, your lens may reflect that Europe is dangerous and scary. If you continue to see that young person’s dream through your lens, you may feel compelled to give them warnings about all the bad things that could happen. You may even forbid them to go. But if you are able to remind yourself that the only lens you can view the world through is your own and that your lens is made up of reflections of your own experiences and assumptions, then you could possibly assess what the true facts are. This will help you continue to build connection, to give more information, and maybe even to learn more things that can help put your fears and assumptions to rest. So, to help you increase your self-awareness and to expedite bringing yourself back to facts and curiosity when you tend to look at the world through your own lens, I want to introduce you to a very well-known and highly regarded tool. This tool, you may have heard of it in the past, is called the Ladder of Inference. The Ladder of Inference was introduced by organizational psychologist Chris Argyris and discussed by Peter Senge in The Fifth Discipline Fieldbook: Strategies and Tools for Building a Learning Organization, the workbook and follow-up to his popular and praised The Fifth Discipline: The Art & Practice of the Learning Organization. Sometimes referred to as leaps of abstraction, the Ladder of Inference is depicted as a stepladder with rungs. Each rung represents a thinking step that we, as humans, tend to take when we are presented with scenarios, problems, or situations. When we climb up the rungs of the ladder, we are actually moving further and further from the actual facts and closer to a conclusion – and maybe also an action – that is filled with our assumptions and bias. In this scenario, you’re going to play the role of an adult who hasn’t traveled much and who has some fears around safety and expense. So, to identify the actual facts, imagine snapping a photograph of the moment when the young person first mentioned their idea to you. At the base of the ladder are the facts. What would you see in that snapshot that you can identify as facts? A young person has an idea to share. They’ve chosen to share the idea with you. Their idea is to explore Europe. Those are truly the facts that we see. Those are the real data. In other words, rung number one on your ladder is what has happened. Rung Two is where we begin to select data and experiences from our own life that we want to pile onto the facts. We add data to the “what’s happening” from Rung One. Maybe you just heard a report of an unsafe situation in Europe, so you might want to add that. Maybe you heard that a trip to Europe is really expensive, and you’re concerned about the young person’s finances. What else might you add from your own data sources or experiences in this scenario? So we take the facts from Rung One, the data we added from our own experiences on Rung Two, and we carry all of that up to Rung Three where we affix meaning. So, if you are still reeling from the report you heard about something tragic happening in Europe, you might affix the meaning that traveling in Europe isn’t safe or you may affix a meaning that traveling in Europe is very expensive and, therefore, it’s unwise. Can you see how you’re climbing the ladder? Can you see how the facts on Rung One are no longer simply the facts? But quickly, as they’re viewed through your personal kaleidoscope, the facts are being transformed into your view. Rung Four is where we begin to make assumptions about the other person’s motivation. So, if you’ve already climbed up the ladder with a bias or a fear about cost, you might make an assumption that the young person is going to ask you to foot the bill. What other assumptions about motivation do you imagine could be added at Rung Four? On Rung Five, we come to a conclusion, frequently saying something like, “Oh, this must be the way it is!” If we believe it may be unsafe to travel to Europe, we may get stuck in trying to convince the young person that it isn’t safe. A great deal of drama and chaos can get created on Rung Five because this is where we are most likely to get hooked into making things work out according to our view, our assumptions, and our bias. Rung Six is where we form beliefs about the situation based on what we created as we climbed up this ladder. This could be where you form a belief that all young people lack good judgment or that you just can’t reason with young people or that everybody who wants to take a year off to travel in Europe is just plain nuts. What other beliefs can you imagine might get formed on Rung Six? So, now we’re on the top rung, Rung Seven, and this is where you take action because it seems like the right thing to do based on all this data you’ve added to the original facts. Can’t you just see it? I can. I’ve done it. So, you can see how climbing up the Ladder of Inference can really contribute to creating drama and chaos, getting people worked up, creating disconnection, and creating lots of misunderstanding and cause us to take action that, if we had stayed with the facts, we may not have taken. The power of knowing about the Ladder of Inference is you can stop on any rung and take yourself back down to the facts, to the real, tangible data, like what you would see in that snapshot you took early on. You can choose to be curious. You can choose to develop a better understanding about other people’s perspectives and views. And you can choose to test your own assumptions and then make decisions based in reality. 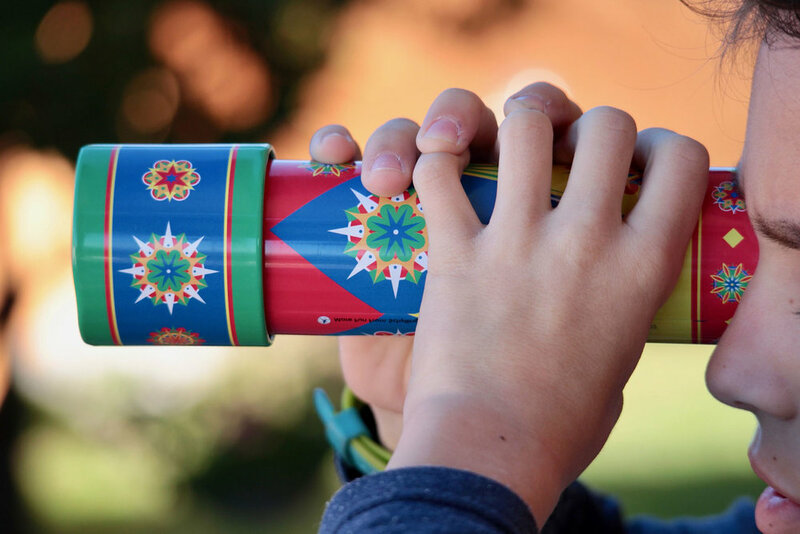 Unlike the view through an actual kaleidoscope, understanding the Ladder of Inference can help you stop and step away from the influence created by your bias, your culture, your experiences, and your environment, and help you make clear and clean decisions – and take action – based on facts. So, the next time you’re sitting in a challenging meeting, listening to someone tell a very dramatic story, or listening to someone share a hope or a dream or a goal – be the observer. If you’ve noticed yourself getting triggered or caught up in it, feeling like you have to take action, stop to identify the facts and notice which rung you might be moving up to. So go on. Go ahead. Give it a try. The next time you’re in a meeting or listening to a story, practice staying in the facts, and remember, if you need a reminder or you need some support with which rungs are which, you can download a printable Ladder of Inference here or read the suggested books listed below. p.s. If you’re noticing what I’ve been noticing, there is a dramatic increase in drama and chaos in many groups and organizations, and it seems to be a result of emotionally challenging conversations. You may want to consider becoming a certified trainer to provide both professional development and mentoring on navigating challenging dialogue. If this sounds interesting to you, go to NavigatingChallengingDialogue.com to learn more.